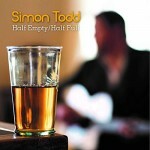 Share the post "Album review: SIMON TODD – Half Empty/Half Full"
Produced by the esteemed songwriter Boo Hewerdine, Northumberland singer/songwriter Simon Todd’s ‘Half Empty/Half Full’ is an aptly titled album that keeps the listener guessing until very end. The title might be interpreted as a reference to observational songs that explore themes from different perspectives. And in doing so, the album places the emphasis squarely on the depth of Todd’s songwriting. He mixes his irony with detachment and occasionally veers to outright pathos, but he offers enough musical contrast and different vocal phrasing to keep the listener interested. There’s plenty of substance to his narratives, which acts as a counterbalance to his light, but pleasant timbre, which on the upside leads to a welcome clarity of diction. The closing ‘Before The Devil Knows Your Dead’, is a sister track full of riff-driven muscular bluster on which he adds musical grit to hard hitting lyrics and an uplifting hook that rounds off the album nicely. You could imagine it becoming a show stopping favourite. In between the two, he gives rein to a wide diversity of songs and musical styles, albeit he never strays too far from an 80’s light pop sounding approach, with a significant melodic undertow. The brusque opener for example, neatly is juxtaposed by ‘Send Her Home To Me’, a reflective love song, which is a good example of how he writes material from a particular perspective, in this case a cuckolded lover. And it’s his ability to see things in a different light that gives this album its consistent concept. As a result, ‘Half Empty/Half Full’ is a triumph in terms of disciplined songwriting. The lyrics provide a constant thread, or inner voice as part of musical journey. The arrangements sometimes emphasize lyrical meaning and moods, but on tracks such as ‘And I Get Weak’, they shift sharply from a stripped down rough-hewn opening with slightly distorted shuffle beat, into a wide screen sound that sharply contrasts with the lyrical meaning, yet it all works. As the song builds to the big defining titular hook, he almost sounds like an 80’s era Tony Hadley meets Boy George. No matter, it’s Todd’s song craft that glues the whole album together, whether on the poignant ‘Poppy Fields’ – a brave song written on the 100th anniversary of World War One – or the musical lightness of touch of ‘Judas Kiss’, which builds up a significant melodic momentum with nuanced bv’s on a song about betrayal. And having dealt with relationships, macro politics and ecology, he bravely digs deep to explore mental illness on ‘Demons’, which finds him in folk singer mode. There’s diversity and contrast again, on the beautifully realized ‘The Rough Spots’ which gently sparkles with stop-time lines, delicate percussion and gently voiced phrasing, before it explodes into a big production hook. Each song and musical development helps the album flow and feels part of a coherent whole, which bring us back to the concept behind ‘Half Empty/Half Full’. This entry was posted in ALBUM REVIEWS, ALBUM REVIEWS (Mobile), All Posts and tagged a cappella, album, Americana, Boo Hewerdine, Boy George, Clive James, folk, Half Empty/Half Full, Nick Cave, Northumberland, Pete Atkin, review, rock, Simon Todd, singer, songwriter, Tony Hadley. Bookmark the permalink.